This weekend, Mike Russom, Meaghan Harding, Jose-Maria Barrero and I traveled down to Norfolk, VA to compete in the MAISA Club Championships held at Old Dominion University. 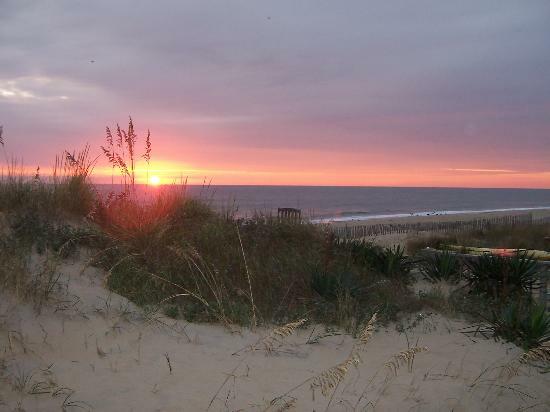 We arrived on Saturday morning to 15-18 knots of breeze and temperatures around 50º. After layering up on shore, Mike and Meg headed out to sail the first set in A division, and started out strong with two third place finishes. They stayed consistent throughout the other three sets sailed on Saturday, with two first place finishes and a few more third places. Mike and Meg were tied for second by the time we finished up racing on Saturday. Jose and I sailed to fourth and second place finishes in our first set in B division, and stayed fairly consistent all day. By finishing first in the last three races of the day, we ended up second to Fordham in B division by the end of Saturday. Overall, Penn was also in second, just behind Fordham. On Sunday, we arrived at the ODU Sailing Center to much calmer but shiftier wind. We completed the remaining two sets of the regatta in 5-8 knots of wind from the north. Although both Mike and Meg and Jose and I had some strong finishes, we struggled at times in the light wind. We ended up third overall, just behind Fordham and University of Virginia. Congratulations to the Fordham Rams for winning the 2012 MAISA Club Championships, and thanks to William and Mary and ODU for hosting the event. Full scores can be found at scores.collegesailing.org/f12.maisa-club-team/full-scores. 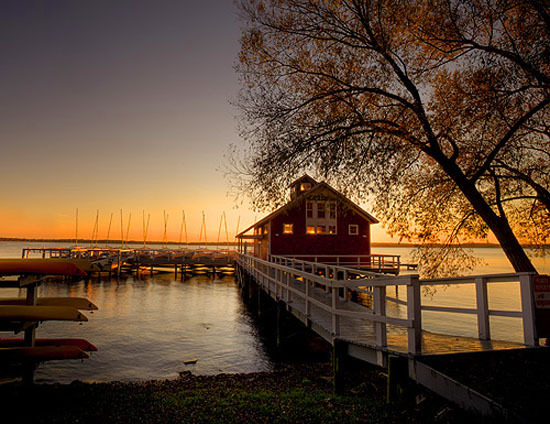 This weekend concluded our Fall 2012 sailing season – thanks to all of our supporters and we will see you back in the spring! This weekend, Christina Johns, Jose-Maria Barrero Patty Andrade, Meaghan Harding, Foster Collins and I returned to the U.S. Merchant Marine Academy at Kings Point for the 2012 War Memorial Regatta- a regatta that serves as the MAISA Fall Championship and the 2012 Atlantic Coast Championship Qualifier. 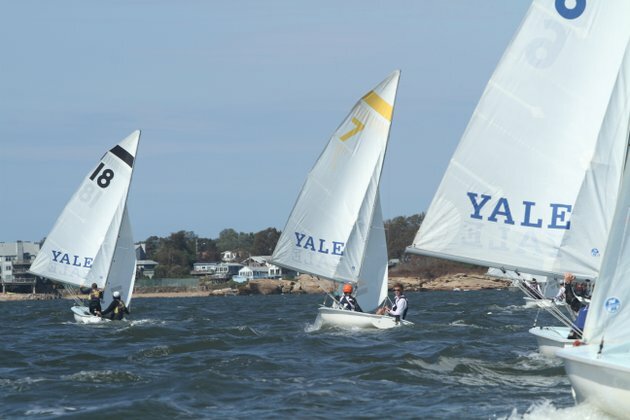 Similar to last week, the regatta was split between FJs and 420s. 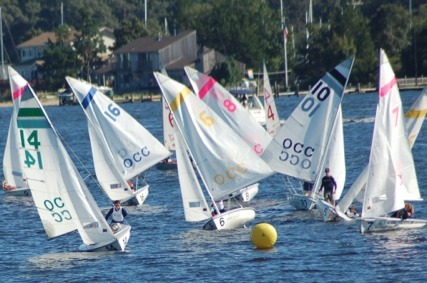 A-Division started in FJs with B sailing in 420s. After 9 races the fleets swapped to ensure equality among the sailors. With Hurricane Sandy on the horizon, our Coach, Jack Kerr wanted to field the best heavy air team possible. 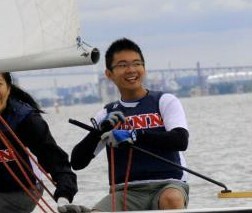 Foster Collins (SEAS ’16) made his Penn Sailing debut joining the team to heavy in the FJ. To our surprise, Saturday morning was calm and sunny. I started the day sailing with Patty as the wind was out of the east at approximately 5 knots. Overall, Patty and I sailed well. We were a little shocked at the aggressive starting tactics but we were able to stay in phase and finish around 10th throughout the day. The highlight of the day was when we won the start of the 5th race in a huge left phase. After the “tack and go” near the pin we led the fleet around the course and won the race. In B-Division, Christina team with Meaghan for all twelve races. Their results were similar as they battled with the strong current and shifty breeze. Once we swapped fleets Meg and Christina were able to end the day on a high note by sailing the FJ well and posting three strong finishes. We ended the day in 11th overall excited to finish the last six races of the regatta in more breeze. On Sunday, Kings Point was beginning to experience the outer bands of Hurricane Sandy. When we arrived the breeze was sustained around 15 knots and building. I started sailing with Jose in the 420. Christina sailed the first race with Meg but opted to go with Foster after the breeze picked up to 20 knots. By the last two races, the breeze was well over 20 knots and the chop was around 2 feet. Jose took over B-Division Skipper and Meg jumped in my boat to help post two strong finishes. All 18 races were completed by 1PM and all 36 boats were derigged and removed from KP’s docks by 3PM. While we didn’t reach our goal of qualifying for the Atlantic Coast Champs we now look forward to defending our MAISA Club Team Championship Title next weekend at Old Dominion University. This weekend Christina Johns, Mike Russom, Jose-Maria Barrero, Patty Andrade and I traveled with our Coach, Jack Kerr to the Kings Point Dinghy Open at the United States Merchant Marine Academy in Kings Point, New York. Mike and Patty (and Jose in heavier conditions) managed the A-Division while Christina and I sailed B-Division. All in all, it was a great event and the team ended up in eighth place out of twenty teams. We sailed sixteen races all together out of a projected twenty. The A-Division sailed FJ’s and the B-Division was in 420’s for the first ten races and we switched fleets for the last six. Despite a lack of wind Saturday morning that prevented us from starting our day until after one pm, the conditions in the afternoon were favorable; steady breeze at 10-15 mph and clear, sunny skies. A-Division got off nine races before sundown and B division did eight. While this meant Mike and Patty would have to sail one race in FJ’s and Christina and I would have to sail two in 420‘s the next morning before switching fleets, at that point it was nearly six and the temperature had fallen below fifty; no one was unhappy to head in. We ended the day in tenth place; certainly a satisfactory standing but we were definitely eager to return the next morning and sail fast. Thankfully, conditions on Sunday morning allowed us to do just that. It was another beautiful fall day with winds at 10-15 mph out of the north. Mike and Patty started off the morning successfully, closing out before lunch with a first place finish. Christina and I were somewhat slower to get off the ground and were having trouble finding our place at the starting line, but once that came together after lunch we finished out the day strong with two sixths and a ninth. Jose came in to crew for Mike when the wind picked up at around one pm and they managed very well in the slightly heavier conditions, ending the day with a first, a second and a sixth. All in all, we had a quality showing on Sunday and left Long Island in high spirits, feeling ready to return for the Atlantic Coast Championship Qualifiers in Kings Point the next weekend. Fall break is Monday and Tuesday so we look forward to getting extra time on the water with our coach before returning to KP to finish the season strong. Thanks to alumni liaison, Skip Swikart for hosting the team at his home on Friday night and KP Freshman, Austin Newman for the photo above. This weekend I sailed the Carl Van Duyne men’s singlehanded regatta. This regatta was hosted at the U.S. Naval Academy in Annapolis, MD and served as the MAISA men’s singlehanded qualifier for the ICSA national championship. 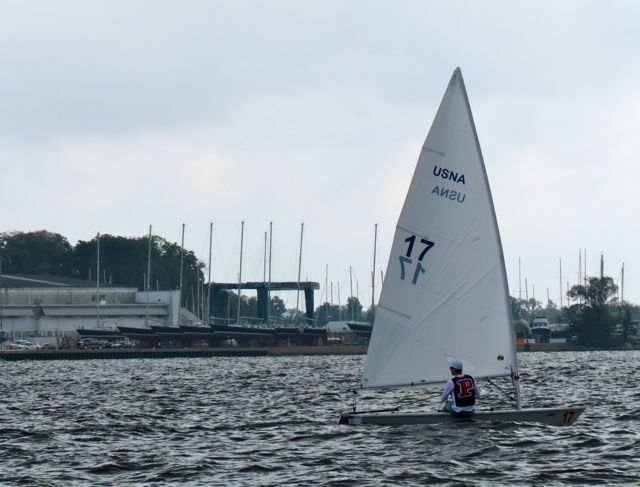 18 sailors assembled at the Naval Academy to compete the prestigious event. 6 qualified at the MAISA south regatta (where I placed 5th), 6 qualified at the MAISA north regatta at King’s Point and 6 qualified at a combined north and south regatta hosted two weekends ago at Navy. On Saturday, I was psyched up. I knew I was a bit of an underdog so I rigged the navy laser as quickly as possible then sat down with my coach, Jack Kerr to try and figure out the 10-knot southwesterly breeze. The sail out was spectacular. In addition to the Van Duyne, Navy was hosting the annual Navy Fall Women’s Intersectional. In total there were 78 navy boats sailing across Annapolis Harbor. This, combined with the sailboat traffic associated with the Annapolis Boat Show, made for a truly spectacular sight. As a senior who has been involved in college sailing for the last six seasons, I couldn’t help but take a moment to admire the day. The racing started in a building 12 knots. The first three races were strange to say the least. I’m not making excuses but over the course of the first three races the wind rotated 90 degrees to the right to align with the Severn River. I finished around mid-fleet for all six races we completed before lunch. After lunch the breeze built to a sustained 20 knots coming straight down the Severn River. Normally with that direction at Navy we sail right off the seawall but due to the Navy Women’s regatta we had to return to our course by the Annapolis towers. I performed significantly better in the afternoon with three top five finishes in the 8 races after lunch. It was a long day in the breeze. After 14 races I finished the day in 7th overall. On Sunday we arrived to chilly temps, rain and very little breeze. Thankfully Navy’s Ian Burman had the foresight to complete most of the regatta on Saturday so, with 4 races planned, we launched and headed to Eastport in a 4 knot Northerly. I was excited at that chance to change the channel. With Jack’s help I developed a plan for to first race. After my best start of the regatta I reached the first mark in the lead and was able to maintain for the rest of the race. In the second race I went and did it again only losing to Georgetown’s Chris Barnard on the last downwind. The last two races of the regatta didn’t go quite as well (finished around 10th) but I was still very happy with my day. I maintained my position and finished the regatta in 7th place. Saturday dawned bright and early with the Penn Sailing team meeting at 7.30am on campus and leaving for the Corinthian Yacht Club shortly thereafter. It was a bit fresher than most of us had anticipated with the temperature hovering in the low 60s for most of the day. While some of us went for a quick coffee run, the others started preparing for the regatta. There were six teams in total which meant that we had to do a minimum of six sets, or twelve races between the two divisions. The other five schools arrived a bit later and by ten o’clock we were able to start the first race. The race courses throughout the day were either W4 or W3, with a downwind gate. The Ocean County Vikings dominated from the start, putting in consistently strong results of 1st or 2nd place finishes. Meanwhile, the Quakers averaged 4th and 5th place finishes in both divisions. We got into the groove as time went on though, and netted a respectable number of 2nd and 3rd place finishes. Unfortunately, with only 8 sets in the entire regatta, the good results were unable to offset the initial ones and both A and B Divisions finished in 5th overall. Philly Fleet Race was a very enjoyable experience for all who took part. More than half of us were competing for the first time, and had only sailed the FJs a couple of times in our lives, so it was really more of a learning experience than anything. 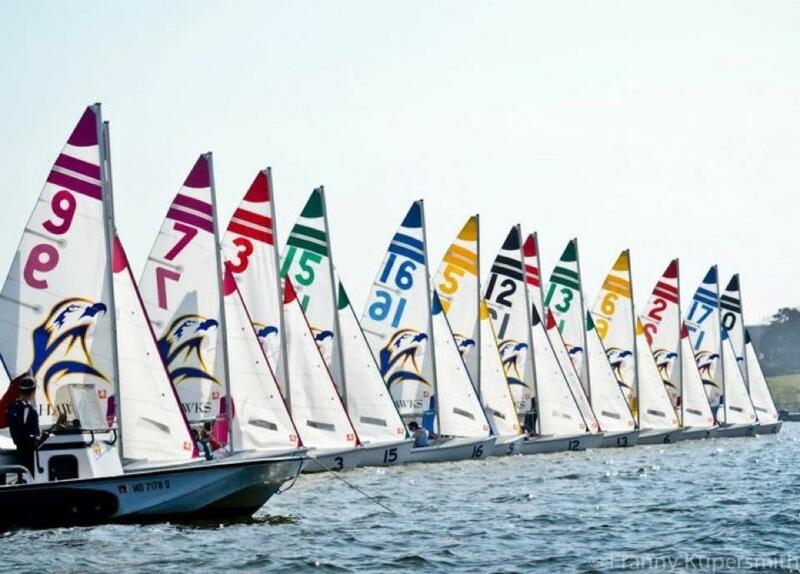 It was good to get acquainted with the format of college sailing regattas, with the two divisions and rotation of boats, while having the familiarity of home waters. I look forward eagerly to the next regatta. 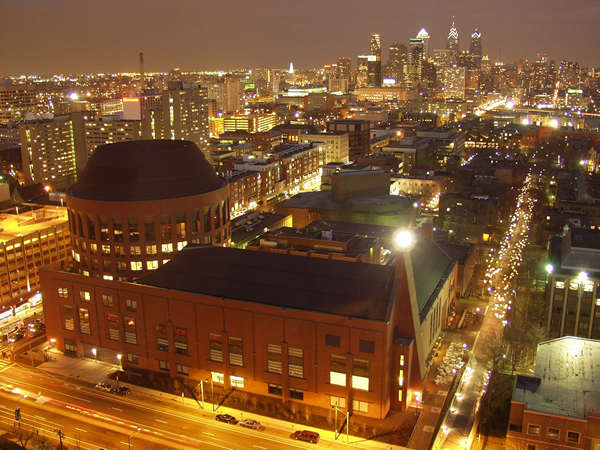 Photo courtesy of Rachel Bleustein of the Daily Pennsylvanian. The weekend of September 22-23, 2012 the Penn Sailing Team traveled to St. Mary’s College of Maryland to participate in their Fall Interconference. From the beginning of the weekend we knew that this would be a competitive event, where we would measure up against several of the country’s best varsity teams. Once we arrived at St. Mary’s facilities on Saturday morning we contemplated the beautiful weather conditions for the day ahead: clear skies, temperature in the 80s, and southerly wind ranging from 8 to 15 knots. With this in mind, we rigged our boats and set out on the water. Captain Mike Russom skippered A division, crewed by sophomore Patricia Andrade, while Co-Captain Christina Johns skippered B as I manned the front of the boat. Saturday was a long, hard day with both divisions sailing 12 races sailed just out of. A division began in FJs while B sailed 420s, switching after nine races near the end of Saturday. The breezy conditions, along with some choppy water and strong competitors made for some great sailing. On most of the upwind legs, Christina and I hiked relentlessly to keep our 420 flat on the water and up to speed, while jumping from rail to rail on tacks. Mike and Patricia also gave their all in their effort to compete, while securing a few mid-fleet finishes on Saturday. By the end of the day we were exhausted from battling the wind and the waves, in addition to the opposing teams. On Sunday morning, we returned to St. Mary’s to complete the last six races, with A division by now in 420s and B in FJs. Although the wind wasn’t as consistently strong as on Saturday, it proved to be a challenging and different day, with temperatures in the 60s, and large wind shifts that could make or break races. Midway through Sunday, Patricia and I exchanged places, so that she sailed the final three races with Christina and I with Mike. After a challenging morning this decision seemed to pay off, with Mike and I finishing in 3rd in our first race together and the girls also feeling more comfortable for the final set. Overall, our experience at St. Mary’s showed us that Penn Sailing was capable of remaining in the fight against most of the other competitors, while we gained valuable time on the water as the Fall 2012 season comes into full speed. 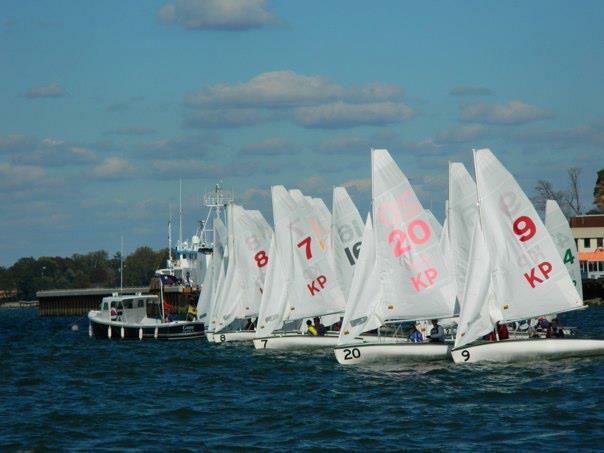 To see the full results go to http://scores.collegesailing.org/f12/st-mary-fall-interconference/. Our women’s team will be back at St. Mary’s next weekend to compete in MAISA Women’s ACC Qualifier. This weekend, Mike Russom, Meaghan Harding, Jose-Maria Barrero and I traveled to Toms River, New Jersey to compete in the Central Fall Qualifier for the War Memorial Regatta later in the season. We arrived on Saturday to 10-15 knots of breeze from the northwest and were excited to get a good start to the regatta with three sets before lunch. Mike and Meg, who were sailing A division in Tech Dinghies, fared well in the shifty conditions and averaged sixth place. Jose and I started the regatta in 420s, and also maintained scores in the 5-7 range. After a quick lunch break, we headed back out and sailed fairly consistently into the late afternoon. After 9 races, we switched fleets, and Jose and I sailed one race in the Tech Dinghy before heading in for the day. Mike and Meg finished out the day strong with three top finishes in the 420. Today, we returned excited to sail, but due to a lack of wind, the regatta was called at noon. We ended up sixth overall, which gets us a berth at the War Memorial Qualifier on the last weekend of October. Full results can be found at http://scores.collegesailing.org/f12/maisa-central-qualifer/full-scores. Thanks to everyone who showed up at our Information Session for the Fall 2012 season! We packed a whole classroom with students of all backgrounds interested in the sailing team! 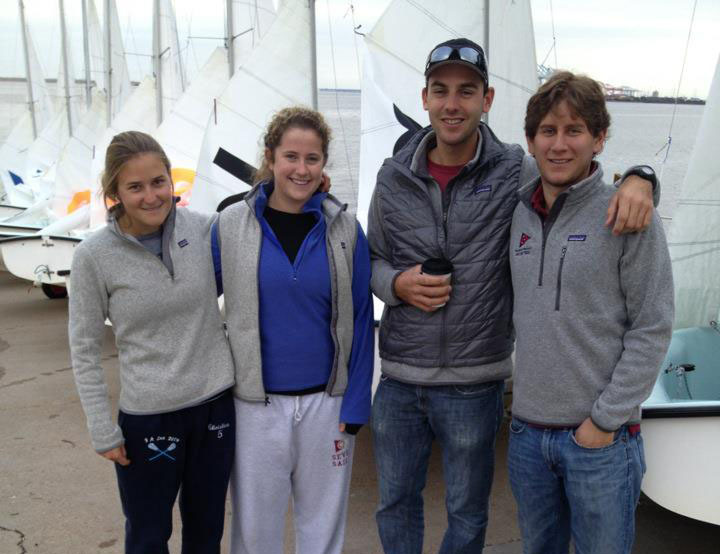 This weekend we opened the 2012 season at the U. S. Naval Academy in Annapolis, MD. I traveled with Villanova’s Will Joumas to participate in the MAISA South Laser Event in an attempt to qualify for the Carl Van Duyne Trophy. When I first arrived in Annapolis I was a little worried about the lack of laser sailing I did over the past summer. I tried hard to sail during my summer in New York but unfortunately I was limited to a few sessions of remote control laser racing in Central Park. While my fellow r/c racers would argue… I feel few things compare to actual time in the boat. On Saturday morning, after a stop at Naval Bagels to fuel up, I rigged the Navy Laser in all its 6-to-1 vang glory and set out to the course in a building 8 knot Southerly. While the first few practice jibes were a little rough, I quickly regained a level of comfort in the boat and was able to post: 9, 3, 9, 5, 4, 5 before lunch. In the afternoon I really tried to focus on my downwind speed (an issue I had in the morning) as the breeze built. By the time we started the seventh race the breeze was up to approx. 15 knots as a huge cold front began to move in on the fleet. I was feeling strong and fast. At one point I was OCS but went back and was able to claw my way back to 8th overall. My finishes for the afternoon were: 4, 3, 8, 3. At approximately 4PM the sky turned black and the call was made to return to shore to try and beat the approaching storm. I was feeling good after a strong last race and began reaching in alongside ODU’s Collin Leon. As we passed Severn Sailing Association, Collin and I speculated as to whether we would get in before the storm hit. I was pretty sure we would be okay but as we approached the Naval Academy seawall- I was wrong. With the entire full-rig fleet and most of the radials still on the water we were hit with a 40-knot squall that some would only describe as “gnarly.” The temperature drop was amazing. Soon after we reached the Naval Academy seawall the lights turned off and we were blasted with violent shots of cool air. When the storm hit, it hit with force. I watched as every single radial was knocked over in front of me. Before I knew what happened my laser flipped and my favorite kaenon hat was gone to the wind. I was left perched on the side of the laser with one foot on the daggerboard and the other on the hiking strap. There I stayed for about 10 minutes trying to prevent the boat from turtling or righting itself in the 40+ knots of breeze. I learned that when it’s going nuts the best thing to do with a laser is lay the rig down and just try and ride out the storm. At points the rain was so intense I could not see Collin who was only 20 ft away! As soon as the breeze dropped down to 25-30 knots I righted the laser and finished the sail in. Thankfully everyone was ok as the Midshipmen did a great job keeping tabs on the flipped fleet throughout the squall. It was quite the end to my first day back in the boat! On Sunday, my quads were happy to see 5-7 knots from the West. The beautiful September weather was very different from the overcast skies of the day before. Unfortunately, the nice weather brought out a lot of pleasure boat traffic so conditions were light and extra choppy on the Severn River. In the first race, I was surprisingly quick downwind. I had a mediocre start but was able to pick a few shifts and get back in the hunt. I rounded the windward mark for the second time in third and was able to pass two top sailors to win the first race of the day- it felt great. Unfortunately, this celebration was short-lived. I posted: 8, 6 before the wind completely shut off and a race was abandoned due to a lack of wind. After an extended lunch / wind postponement, we went back out to give it one last go. I really struggled in the light breeze and boat chop. It wasn’t necessarily a speed issue; rather I just could not make a good tactical decision in the trying conditions to save my life. There was one point when I lost 7 boats on the downwind after rounding the second windward mark in 3rd and going to a side that I thought had more wind; it was extremely difficult sailing. In the end I finished 10, 10, 6 to complete the regatta. I ended up 5th overall with a considerable margin to the 6th place finisher, George Prieto. Georgetown’s Chris Barnard took top honors at the regatta. The top six move finishers move on to the Carl Van Duyne so I’m excited to get to the next step in the singlehanded nationals qualification process. Next week we will be at OCC trying to qualify for War Memorial Trophy! Fall 2012 Season Is Underway! Our boats are down and on the dock… let’s get ready to roll! 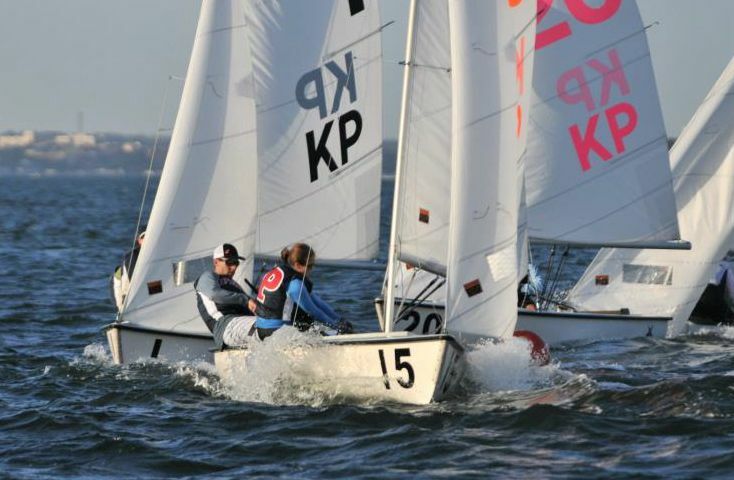 Penn’s women’s sailing team finished in 9th place at the 2012 MAISA Women’s Dinghy Championships held on April 21-22 at Old Dominion University. Junior Christina Johns and senior Kelsi Schoenrock sailed A division, while junior Emma Kofmehl and senior Marina Reppucci sailed B division. On Saturday, the day started with very light and shifty conditions, which were difficult for all competitors to manage. However, it built to more consistent breeze by the end of the day and after 10 A races and 8 B races completed on Saturday, Penn was in 9th. Sunday brought heavy rain and more consistent wind, and in the end, the team retained their ninth place finish to finish up their season. Congratulations to the Georgetown Hoyas for winning the 2012 MAISA Women’s Championships! The America Trophy was held this year at Hobart and William Smith Colleges in Geneva, NY. The Mid-Atlantic district uses this event as their qualifier for the semifinals of the national championship, where the top 8 teams advance. 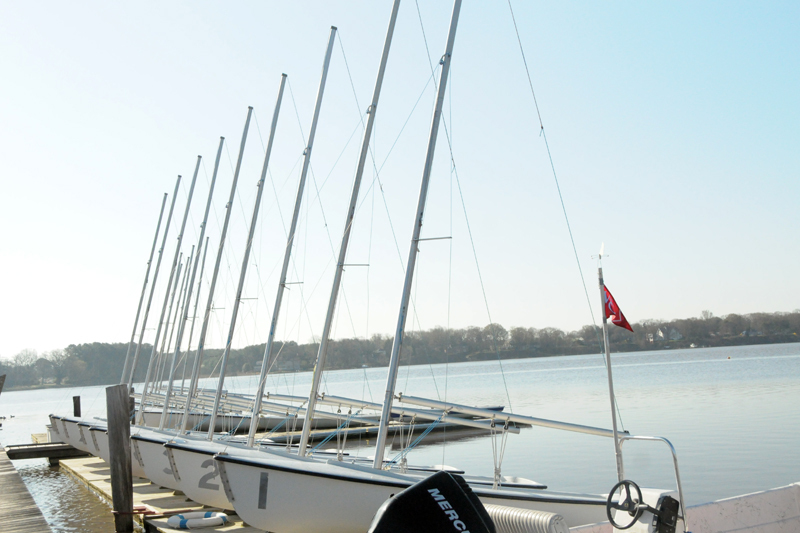 The regatta was held in 420s out of Hobart’s facilities, located right at the north end of Cayuga Lake. Freshman Jack Swikart skippered the A Division with senior Kelsi Schoenrock crewing, while junior captain Mike Russom skippered B division with fellow junior Christina Johns crewing. While upstate New York experienced frigid temperatures and even snow during the week leading up to the event, Saturday morning brought sunshine and a cool, pleasant morning. The sailors arrived at the lake to find perfect sailing conditions, but they didn’t last long. The breeze began to shut off after just 3 races, and didn’t return until late in the afternoon, when 3 more races were completed. After Saturday’s racing, the Quakers stood in 9th place, with only a few points separating them from the teams in front of and behind them. Georgetown led the event after day 1. The weather on Sunday was more cooperative, with clouds, cooler temperatures, and a light southerly breeze to start the day. However, the conditions proved no less challenging than the previous day’s for the sailors, but the race committee still managed to complete 10 races in both divisions. The Quakers managed to keep pace with all the top teams, but at the end of the day ended up in 10th place. This was not enough to qualify them for semi-nationals, but everyone feels they learned from the experience. The Women’s Team will travel next weekend to Old Dominion University for their semi-nationals qualifier.